Home » Sports » Sabres Already?? 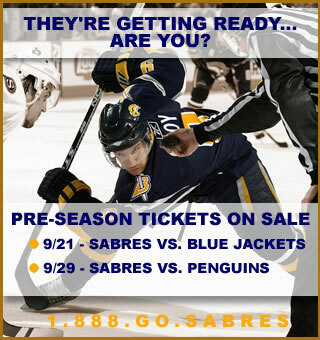 The Sabres sent out an e-mail yesterday with an ad for pre-season tickets. The games start September 21st! Holy cow! I love hockey, and think it will be another fun season in Buffalo… but I can’t believe it’s hockey season already! They are offering 50% off on kids tickets for the pre-season games. Click the photo for details.